With three different pencilers and just as many inkers, it's easy to classify this as a filler issue, dropped in during the regular artist's month off. And, to an extent, that's exactly how it looks. None of the artists in question are delivering work that's really top-tier, and I don't see anything here to merit a jump in status. 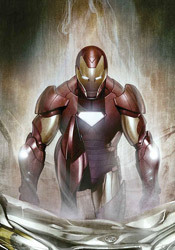 Writer Stuart Moore does his part to limit the damage by segmenting off each artist's contribution to a specific moment in time; a unique artistic team handles the flashback that opens the story, Iron Man's appearances in Europe, and his SHIELD underling's ongoing interactions with the Overkill Horn, respectively, but that can only accomplish so much. This artistic team misses countless opportunities for gigantic visuals and complicates the story with clunky, inconsistent paneling. Their work is universally ho-hum, even when it's meant to be flying off of the page, and as such they do a disservice to the story. It's not easy to siphon the energy from a scene that features a man in a flying robotic suit of armor exchanging gunfire with a platoon of foreign soldiers, but these guys find a way. I never felt excited by what was going on, never felt motivated to turn the page in any kind of hurry to see how things played out. It was just business as usual, both for the characters in the story and for the reviewer reading it. Not everything can be a home run, I guess. Stuart Moore's story is fresh, if not always compelling. His take on overseas sentiment against American ideals is timely, and I don't have a hard time believing that a foreign army would take potshots at a visible US target like Iron Man. He's delving into the tough grey area that exists between clean-cut right and wrong answers, and Stark's hesitance to engage these troops for merely defending their territory is understandable. It's a brave new world out there, and it's no longer cool or appropriate to shoot first, or even second, without a valid reason. Moore understands this, and while it's not the centerpiece of the story, it's a welcome addition all the same. Unfortunately, despite the exhausting amount of detail and modern relevance it involves, I had a hard time getting into Moore's story. His characters all seem to lack humanity. They flat-out refuse to show any sign of weakness, or really anything beyond bold, absolute certainty. He allows himself to get too caught up in the particulars of the concepts he's imagined, which are admittedly pretty cool, but he loses sight of the main narrative along the way. I found myself intrigued by his interest in those small concepts, but bored silly by the slow movement of the plot itself. Even in more capable artistic hands, this story would have stumbled… but matching a slow, dreary pace with a team of unexciting, lower-level artists is a recipe for disaster. There's something of value here, but you have to do a lot of digging to uncover it, and you'll wind up casting the majority of the storyline by the wayside in the process. It's not really worth the effort. Skip it.